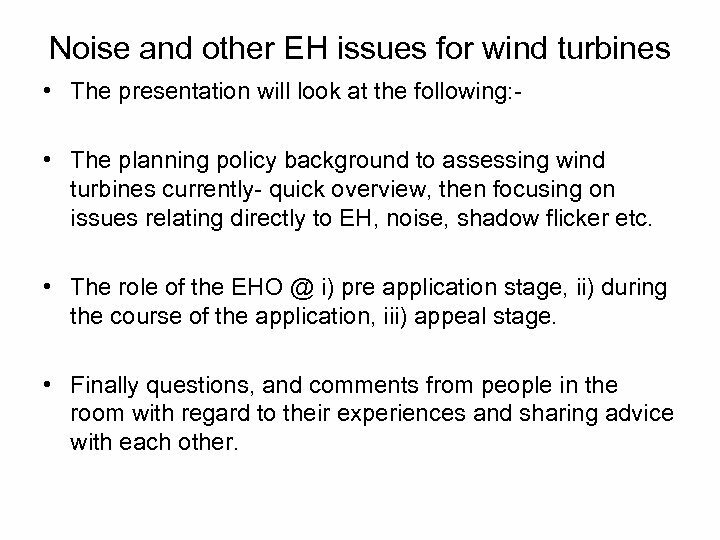 Noise and other EH issues for wind turbines • The presentation will look at the following: • The planning policy background to assessing wind turbines currently- quick overview, then focusing on issues relating directly to EH, noise, shadow flicker etc. • The role of the EHO @ i) pre application stage, ii) during the course of the application, iii) appeal stage. • Finally questions, and comments from people in the room with regard to their experiences and sharing advice with each other. 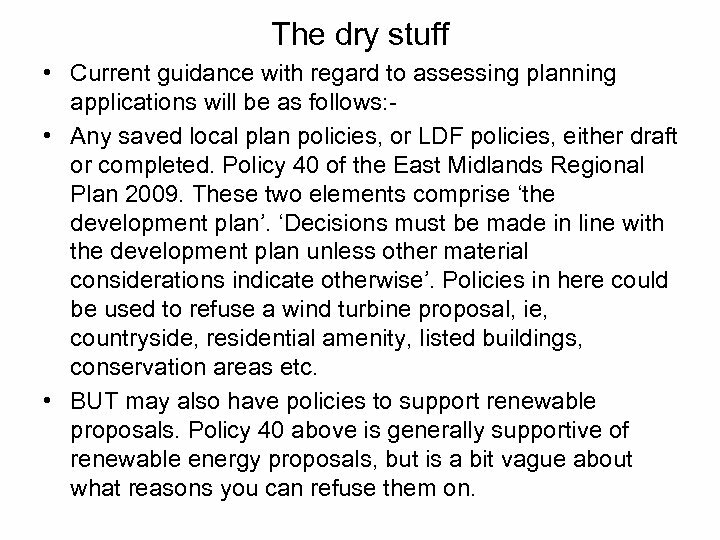 The dry stuff • Current guidance with regard to assessing planning applications will be as follows: • Any saved local plan policies, or LDF policies, either draft or completed. Policy 40 of the East Midlands Regional Plan 2009. These two elements comprise ‘the development plan’. ‘Decisions must be made in line with the development plan unless other material considerations indicate otherwise’. 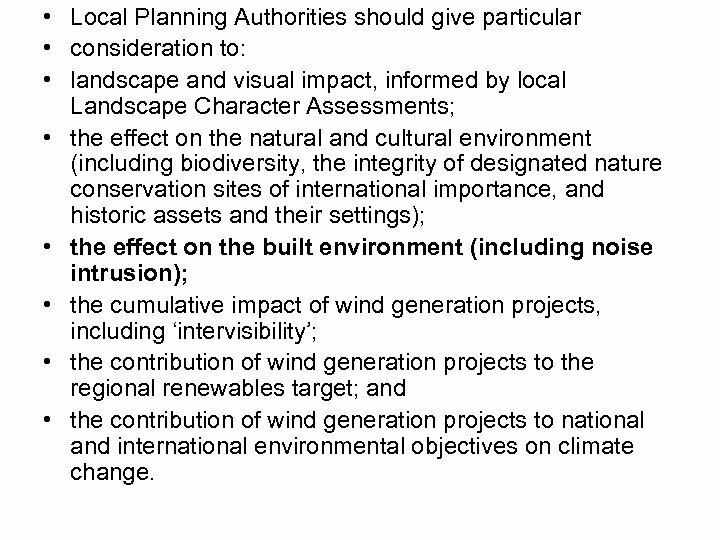 Policies in here could be used to refuse a wind turbine proposal, ie, countryside, residential amenity, listed buildings, conservation areas etc. • BUT may also have policies to support renewable proposals. 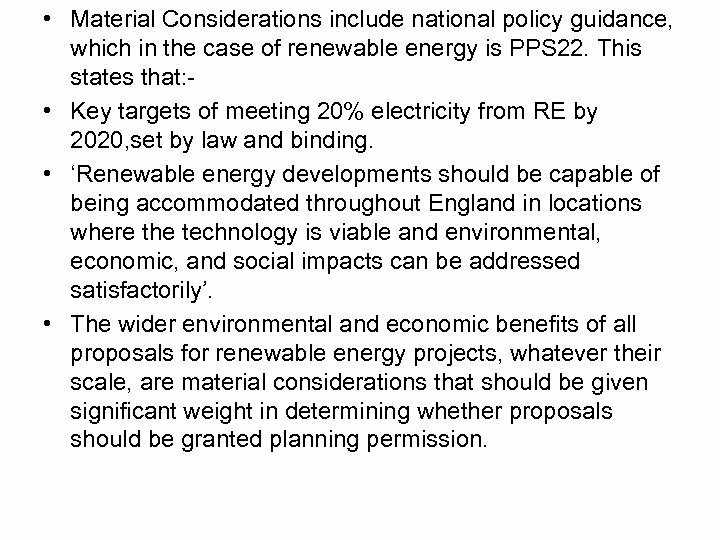 Policy 40 above is generally supportive of renewable energy proposals, but is a bit vague about what reasons you can refuse them on. • Local Planning Authorities should give particular • consideration to: • landscape and visual impact, informed by local Landscape Character Assessments; • the effect on the natural and cultural environment (including biodiversity, the integrity of designated nature conservation sites of international importance, and historic assets and their settings); • the effect on the built environment (including noise intrusion); • the cumulative impact of wind generation projects, including ‘intervisibility’; • the contribution of wind generation projects to the regional renewables target; and • the contribution of wind generation projects to national and international environmental objectives on climate change. • Material Considerations include national policy guidance, which in the case of renewable energy is PPS 22. This states that: • Key targets of meeting 20% electricity from RE by 2020, set by law and binding. • ‘Renewable energy developments should be capable of being accommodated throughout England in locations where the technology is viable and environmental, economic, and social impacts can be addressed satisfactorily’. • The wider environmental and economic benefits of all proposals for renewable energy projects, whatever their scale, are material considerations that should be given significant weight in determining whether proposals should be granted planning permission. 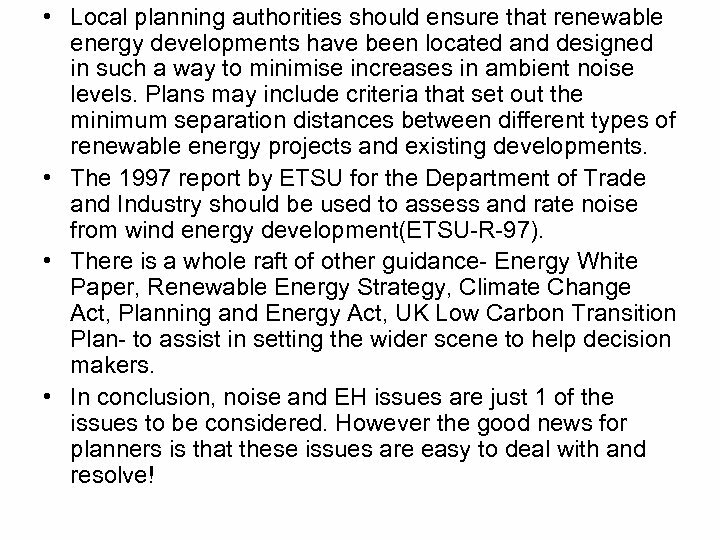 • Local planning authorities should ensure that renewable energy developments have been located and designed in such a way to minimise increases in ambient noise levels. Plans may include criteria that set out the minimum separation distances between different types of renewable energy projects and existing developments. 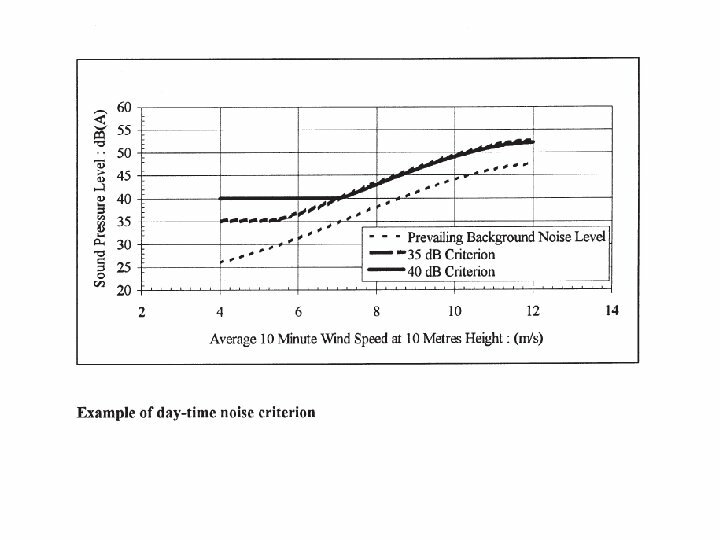 • The 1997 report by ETSU for the Department of Trade and Industry should be used to assess and rate noise from wind energy development(ETSU-R-97). • There is a whole raft of other guidance- Energy White Paper, Renewable Energy Strategy, Climate Change Act, Planning and Energy Act, UK Low Carbon Transition Plan- to assist in setting the wider scene to help decision makers. • In conclusion, noise and EH issues are just 1 of the issues to be considered. However the good news for planners is that these issues are easy to deal with and resolve! • Why is that? • i) You are the Experts! • ii) The guidance is very clear. 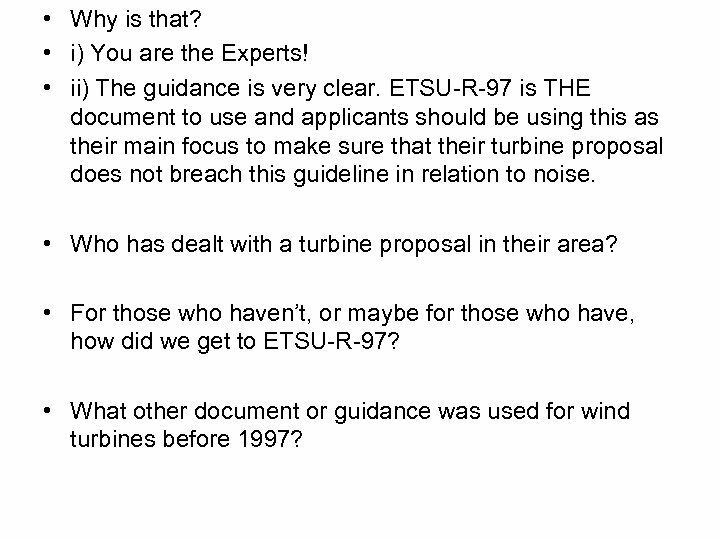 ETSU-R-97 is THE document to use and applicants should be using this as their main focus to make sure that their turbine proposal does not breach this guideline in relation to noise. • Who has dealt with a turbine proposal in their area? • For those who haven’t, or maybe for those who have, how did we get to ETSU-R-97? 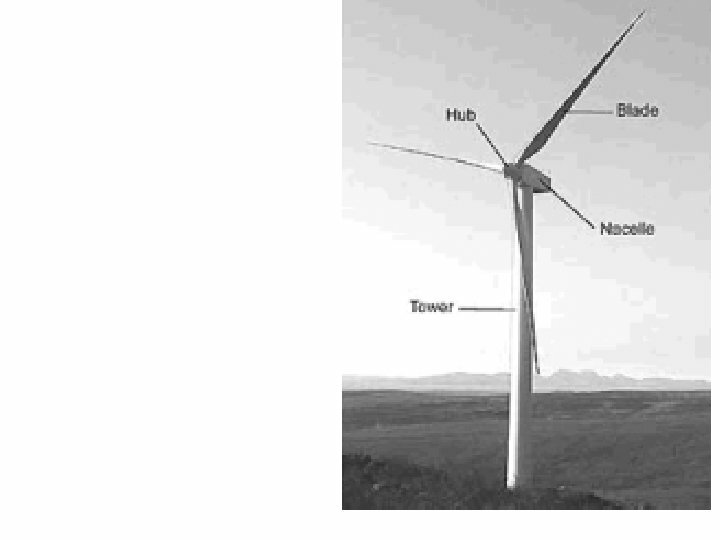 • What other document or guidance was used for wind turbines before 1997? • Previously it was the British Standard BS 4142 - 1990. 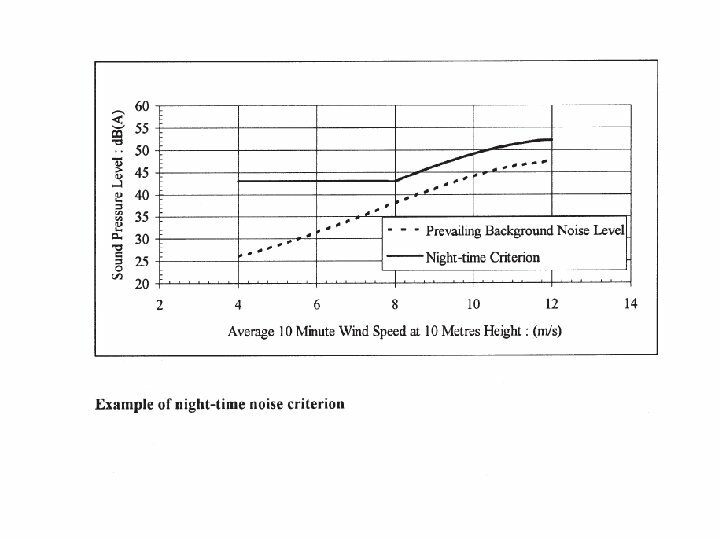 • At the time of writing there was insufficient relevant experience of noise from wind farms in the UK. Difficult to relate this and interpret it for turbines issues. 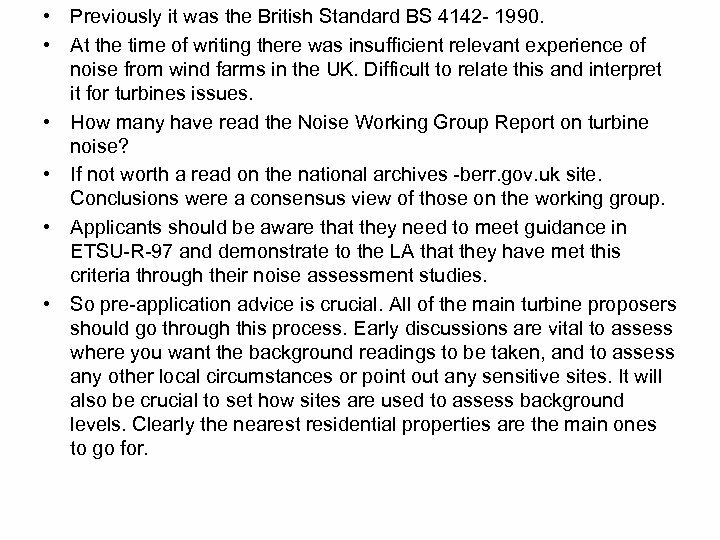 • How many have read the Noise Working Group Report on turbine noise? • If not worth a read on the national archives -berr. gov. uk site. Conclusions were a consensus view of those on the working group. • Applicants should be aware that they need to meet guidance in ETSU-R-97 and demonstrate to the LA that they have met this criteria through their noise assessment studies. • So pre-application advice is crucial. All of the main turbine proposers should go through this process. Early discussions are vital to assess where you want the background readings to be taken, and to assess any other local circumstances or point out any sensitive sites. It will also be crucial to set how sites are used to assess background levels. Clearly the nearest residential properties are the main ones to go for. 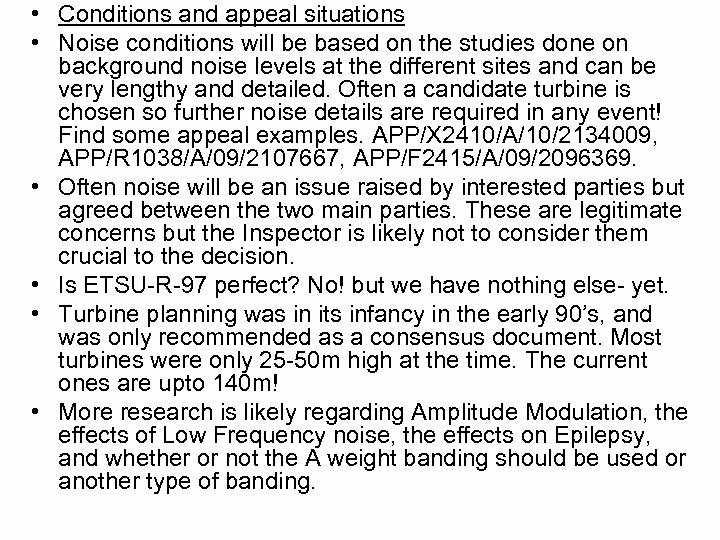 • Conclusions on noise- in this instance it was concluded that this was a noisy environment, and the turbine met the standards. 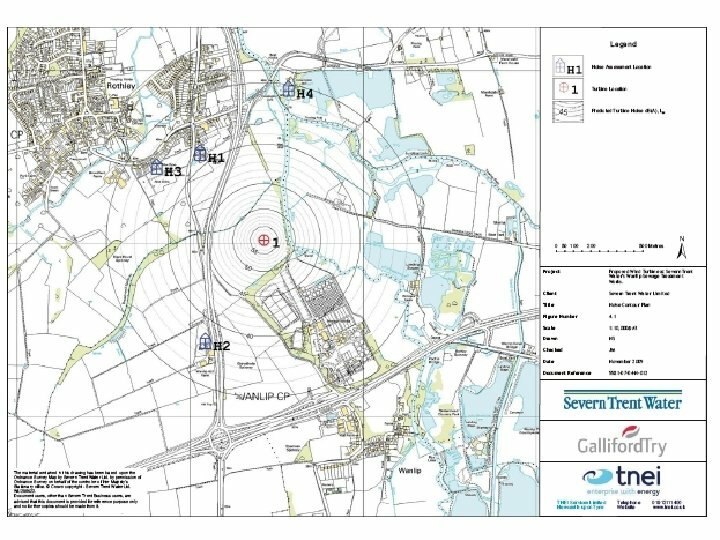 However in another case at Queniborough which was considered to be a quiet environment there was an issue in relation to the turbine noise within the garden of a nearby property being over the 35 d. BA limit, and ETSU-R-97 would be breached. 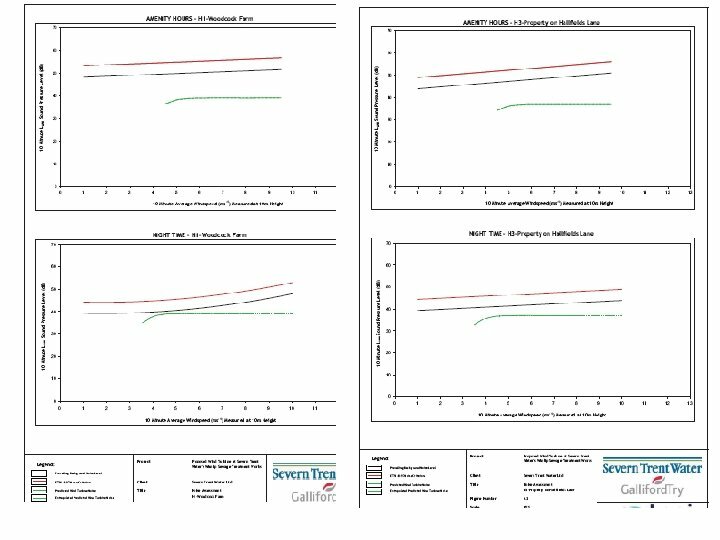 In this instance the applicants agreed that there would be a 2 d. BA reduction in sound power output of the offending turbine and this could be controlled through condition. • You as an EHO should liaise closely with your planners to ensure that they understand your concerns if any with the submitted information in the ES or EIA and whether the methodology is correct and complies with ETSU-R-97. If it does, then your recommendation is likely to be that there is no reason to refuse the proposal based on the submitted noise report. • So in most respects if you get i) and ii) right, you will not end up in an appeal scenario! • Before dealing with conditions and appeals we will have a quick look at shadow flicker. • What is it? Considered to be the effect of a blade passing in front of a window causing light to decrease inside the house. This would happen either 2 or 3 times every blade rotation. 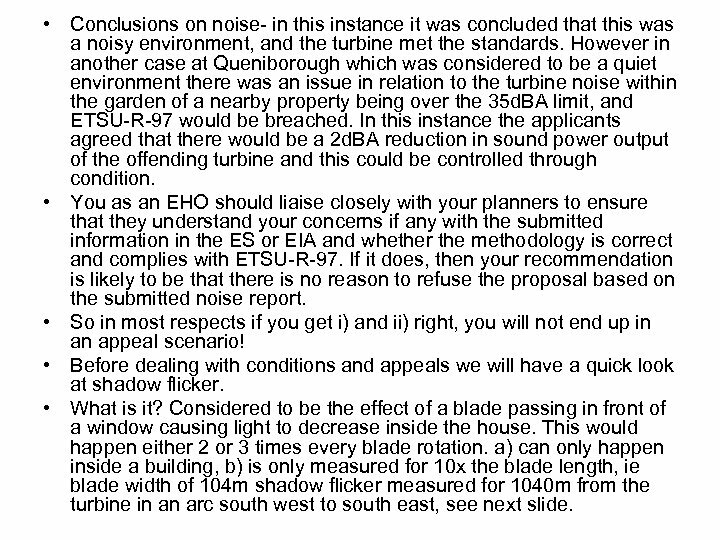 a) can only happen inside a building, b) is only measured for 10 x the blade length, ie blade width of 104 m shadow flicker measured for 1040 m from the turbine in an arc south west to south east, see next slide. 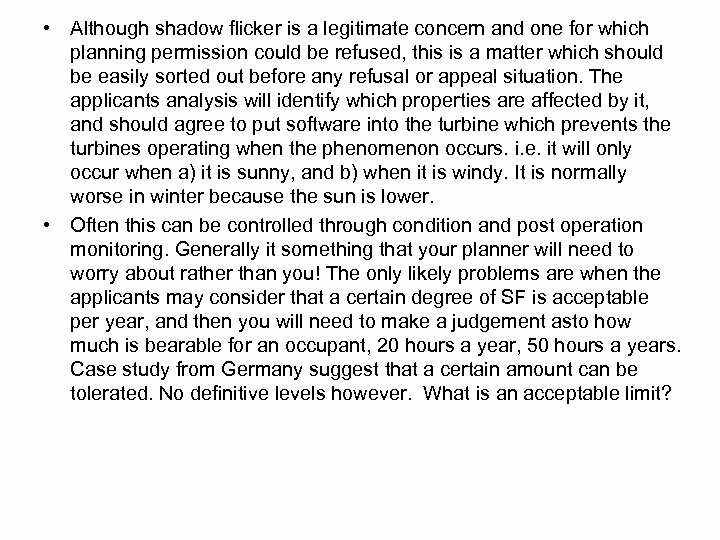 • Although shadow flicker is a legitimate concern and one for which planning permission could be refused, this is a matter which should be easily sorted out before any refusal or appeal situation. 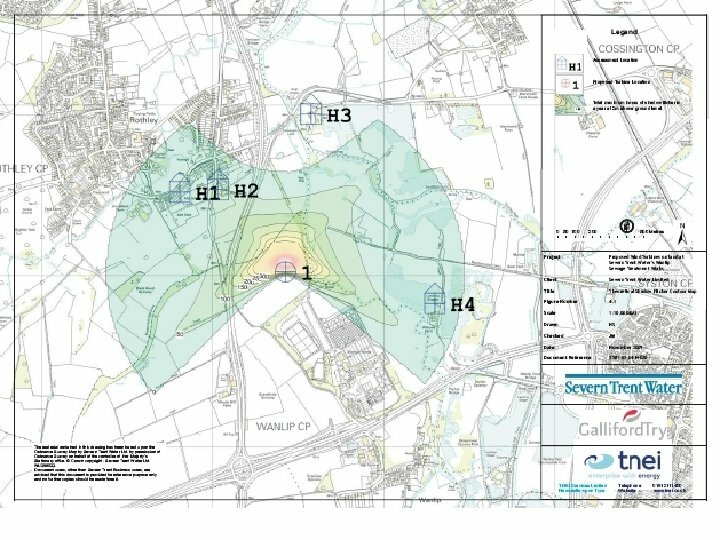 The applicants analysis will identify which properties are affected by it, and should agree to put software into the turbine which prevents the turbines operating when the phenomenon occurs. i. e. it will only occur when a) it is sunny, and b) when it is windy. It is normally worse in winter because the sun is lower. • Often this can be controlled through condition and post operation monitoring. Generally it something that your planner will need to worry about rather than you! The only likely problems are when the applicants may consider that a certain degree of SF is acceptable per year, and then you will need to make a judgement asto how much is bearable for an occupant, 20 hours a year, 50 hours a years. Case study from Germany suggest that a certain amount can be tolerated. No definitive levels however. What is an acceptable limit? • Conditions and appeal situations • Noise conditions will be based on the studies done on background noise levels at the different sites and can be very lengthy and detailed. Often a candidate turbine is chosen so further noise details are required in any event! Find some appeal examples. APP/X 2410/A/10/2134009, APP/R 1038/A/09/2107667, APP/F 2415/A/09/2096369. • Often noise will be an issue raised by interested parties but agreed between the two main parties. These are legitimate concerns but the Inspector is likely not to consider them crucial to the decision. • Is ETSU-R-97 perfect? No! but we have nothing else- yet. 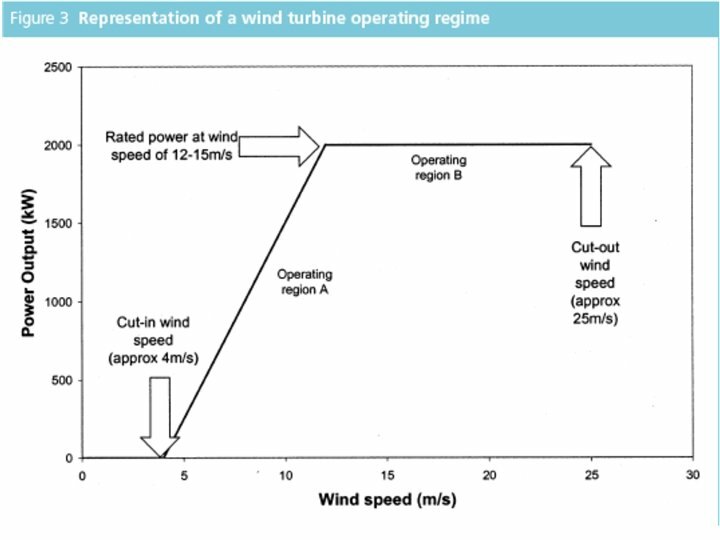 • Turbine planning was in its infancy in the early 90’s, and was only recommended as a consensus document. Most turbines were only 25 -50 m high at the time. The current ones are upto 140 m! • More research is likely regarding Amplitude Modulation, the effects of Low Frequency noise, the effects on Epilepsy, and whether or not the A weight banding should be used or another type of banding. 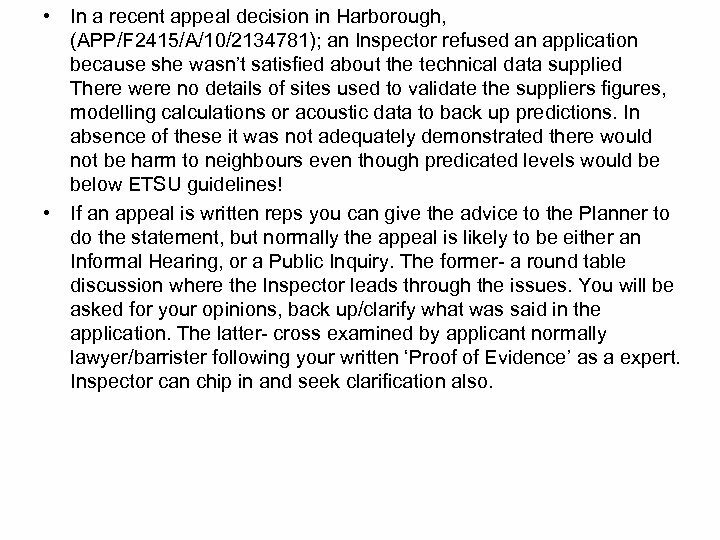 • In a recent appeal decision in Harborough, (APP/F 2415/A/10/2134781); an Inspector refused an application because she wasn’t satisfied about the technical data supplied There were no details of sites used to validate the suppliers figures, modelling calculations or acoustic data to back up predictions. In absence of these it was not adequately demonstrated there would not be harm to neighbours even though predicated levels would be below ETSU guidelines! • If an appeal is written reps you can give the advice to the Planner to do the statement, but normally the appeal is likely to be either an Informal Hearing, or a Public Inquiry. The former- a round table discussion where the Inspector leads through the issues. You will be asked for your opinions, back up/clarify what was said in the application. The latter- cross examined by applicant normally lawyer/barrister following your written ‘Proof of Evidence’ as a expert. Inspector can chip in and seek clarification also.